FitClic Neo is the most secure and versatile phone mount system for any situation. The two-piece modular design allows users to mount their smartphones wherever they go without having to change their phone case for each mount. FitClic Neo allows users to easily access their phone in any situation. The FitClic Neo system is made up of two parts. The case or the adhesive-backed universal tag that can attach to most, and the mount that has the FitClic Neo locking mechanism at the top. The twist-lock design works together with magnets to rotate and self-lock the device, securing it onto the mount with no effort. Once the device is mounted, the only way to unlock it is to rotate the lever on the mount, which is designed to protect against accidental detachment. 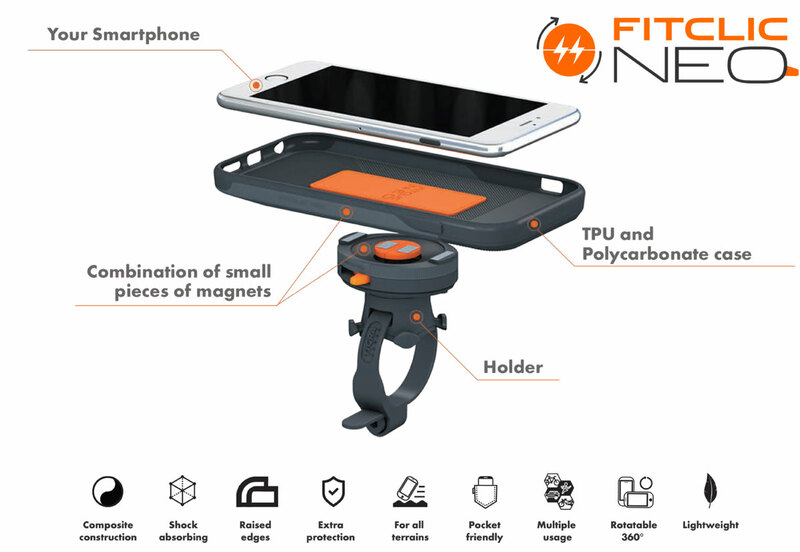 With FitClic Neo, it’s quick, easy and effortless to mount any smartphone to a bike, motorcycle, car, wall, or armband. FitClic Neo offers a case that is compatible with the iPhone 6, 6+, 6s, 6s+, 7, 7+, 8, 8+ and iPhone X. FitClic Neo also offers a universal adhesive tag that can go on the back of any smartphone so users don’t have to swap out their existing case for the FitClic Neo case. FitClic Neo’s flat-back design makes it pocket-friendly and easy to lie flat on tables. Its patent-pending design cleverly employs a combination of small magnets to perform mechanical twist-locking automatically”, said Timothy Ho, Tigra Sport founder. “All you need to do is to place a FitClic Neo enabled device near the mount, and the system will do the rest like magic. The result is the lightest, slimmest, strongest and most secure mounting system for smart devices, which is also the easiest to use.